"Redefining Robotics" - OE Magazine, March 2003, - p. 32-33. "Special Report: Gurus of Technology - Five People Pushing the Tecnology Boundaries" Business Week Online. April 1, 2003. 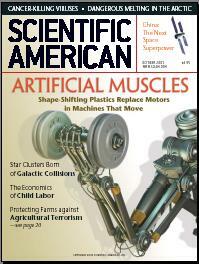 "Special Report: Gurus of Technology - The Brain behind Plastic Muscle" Business Week Online, April 1, 2003. "The Brain behind Plastic Muscle" Business Week, April 1, 2003. "Beta Exact Bekeken," Spierkracht (in Dutch), Steven Bolt, popular science monthly, KIJK April 2000, page 20-21. "En 20 anos el hombre podria llevar musculos artificiales," Diariovasco (San Sebastian Newspaper), June 20, 2000. "Technology," JPL, Universe, January 5, 2001, page 2. "Ultrasonic Drill on Mars," Maariv, Israeli daily newspaper, Aug. 19, 2001. "Drilling into the Future", JPL's Technology Spotlight, Sept. 7, 2001.